Note: This process is best for less detailed line art, for highly detailed art it is best to order our dyesub printed tablecovers. 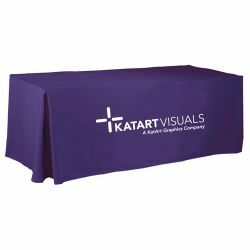 Custom size printed tablecloths and table throws are available. Please email or call 800-410-0553 with your special table covering requirements. 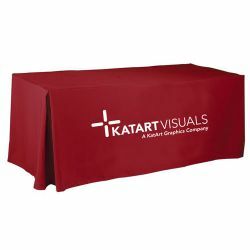 Minor layout is included in the cost of your printed tablecloths. Just send us your logo and we will do the rest. 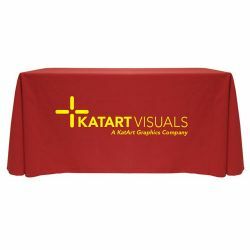 For custom printed tablecloths, table throws and custom printed table runners, most customers want just a logo or 2 and a maybe a line of type. Just send us (artwork submission info is on our Artwork Guidelines Page) the logos in a format listed on our Artwork Guidelines Page with any instructions as to what you are looking for. For more complex layouts there will be an extra charge. If in doubt, just send an email and we will be glad to help.